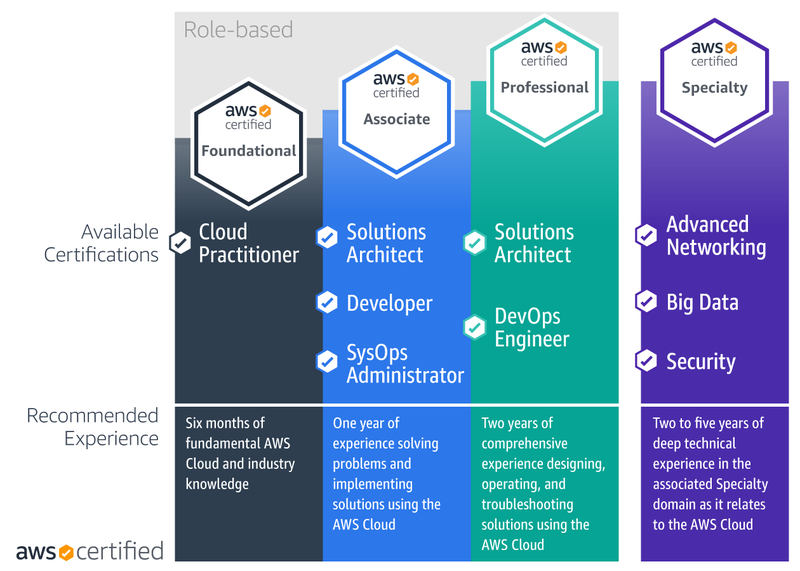 AWS offer role-based certifications to validate expertise for those in Cloud Practitioner, Architect, Developer, and Operations roles, plus Specialty certifications to validate advanced skills in specific technical areas. View our learning paths to find training to help you build skills and prepare for AWS Certification. This certification path is intended for individuals who are looking to build and validate overall understanding of the AWS Cloud. This path is useful for individuals in technical, managerial, sales, purchasing, or financial roles who work with the AWS Cloud. These paths are designed for solutions architects, solution design engineers, and anyone who wants to learn how to design applications and systems on AWS. Build your technical skills and progress along a path to earn AWS Certification with these recommended courses, labs, and exams. These certification paths are designed for software developers who want to learn how to develop cloud applications on AWS. Build your technical skills and progress along a path to earn AWS Certification with these recommended courses, labs, and exams. These paths are designed for sysops administrators, systems administrators, and those in a DevOps role who want to learn how to create automatable and repeatable deployments of applications, networks, and systems on the AWS platform. Build your technical skills and progress along a path to earn AWS Certification with these recommended courses, labs, and exams. AWS offer three Specialty certification paths with focuses on Advanced Networking, Big Data, and Security. These paths are designed to build and validate advanced skills in specific technical areas. Progress along a path to earn AWS Certification with these recommended courses, labs, and exams.